This Jeppesen Sanderson avstar gives you an example of using existing products like the TI-35 for other purposes. An identical product was sold under the labels of Beechcraft, Cessna, Hughes Helicopters and Piper. The housing of the avstar was later changed, view the enhanced avstar here and read more details about functions. Between these changes an enhanced product was sold as prostar. Later Flight computers sold by Jeppesen Sanderson like the Techstar based on a non-TI design. If we trace back in the history of electronic flight computers we discover: The Commodore N60, the Heathkit OCW-1401 and the navtronic 16 resp. 1701t models. 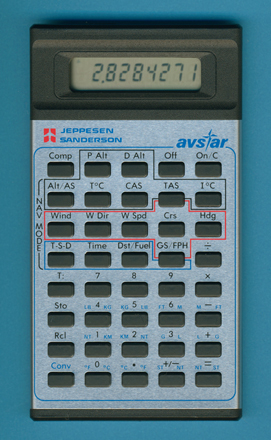 All were introduced in the year 1978, two years before this Jeppesen Sanderson avstar appeared. Compare this flight computer with the advanced USMC HARRIER calculator.